While spring is still in full force (not these past few days - it crept slowly back to fall these past few days), I am already thinking ahead to summer! Mainly because from my experience it is spring for a hot minute and then BAM! It's full blown summer. 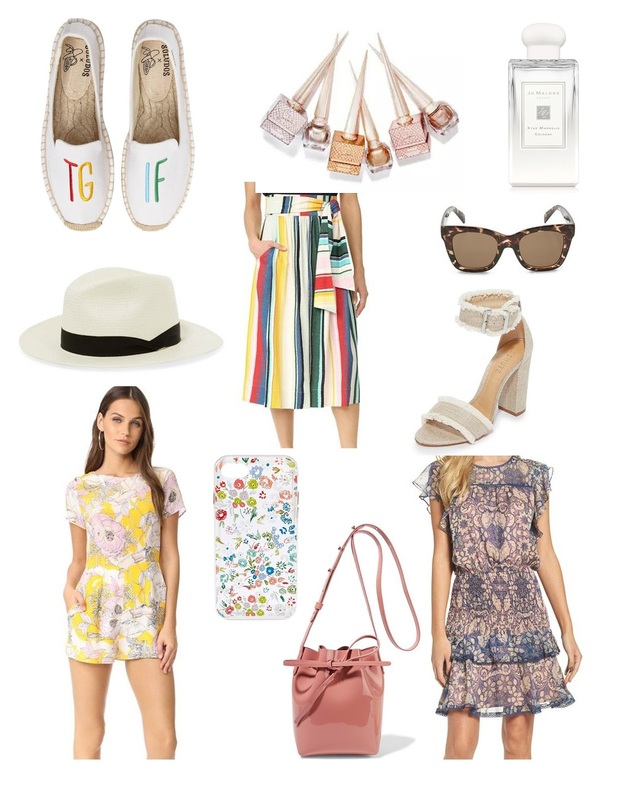 LOL Here are some summer picks that I am loving! 1. Soludos Espadrilles - I already have a pair of striped Soludos and love them for running around in the summer. These TGIF ones are super adorable and fun to add to a basic tee and shorts outfit. 2. Louboutin Metalinudes Nail Colors - I surprisingly have never purchased any of the Louboutin nail colors, but these Metalinudes are tempting me. I do love a neutral and a shiny neutral is right up my alley! 3. Jo Malone Star Magnolia Cologne - It's been awhile since I bought a Jo Malone fragrance but this new launch caught my eye. After reading it's notes of lemon, citrus and sandalwood, I think this may be a gorgeous summer scent. 4. Rag & Bone Panama Hat - I already ordered this hat and it's on its way to me now. I love a good cheap buy when it comes to hats, but to be honest my more expensive ones have lasted me so much longer and end up looking much better. 5. Whit Striped Skirt - This is a bit of a splurge skirt, but it's so unique and is more versatile than one would think! I would wear a white/black tee or a chambray shirt with it and let the skirt stand out. A straw tote and casual sandals would complete the look. 6. Quay sunglasses - I have been eyeing Quay sunglasses for the past year and they always seem so chic and well-made for the price. This tortoise shell pair looks like a great classic that you could wear for years! 7. Schutz sandals - Neutral sandals with a twist! These immediately caught my eye because of the color (obviously), but the texture and details of it make them a bit more interesting than any ol' sandal. 8. Yumi Kim Romper - I live for a romper in the summer and this bright yellow floral one looks like a cute date night option or even fun for during the day with slides, a big hat and tote. 9. Rebecca Minkoff Phone Case - I love switching up my phone case each season, and this floral one looks so cute! 10. Mansur Gavriel Mini Mini Bucket Bag - I have never been a pink or blush fan, but this year is totally converting me. I already love my Mansur Gavriel bucket bag in black, but this mini mini style in a patent blush is gorgeous! There are some colorful handbags that I can't justify, but this one I definitely can. 11. Chelsea28 Dress - One can never have too many easy summer dresses to throw on for any occasion, right?! This one with the gathered waist is a style that I always gravitate towards since it accentuates the waist making it much more flattering.